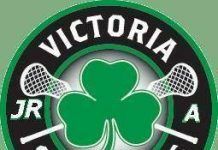 July 6, 2013, Victoria, BC (ISN) – Today the Intermediate and Jr. Shamrocks both wrapped up the home portion of their regular season schedules and both came away with wins. In the early contest the Intermediates jumped out to period leads of 5-1 and 12-3 against the Langley Thunder before relaxing a bit and being outscored 7-3 in the third period. That makes it a 15-10 win for the boys in green. Unofficially it was Cole Pickup and McLean Chicquen leading the way offensively, each with 4 goals and 2 assists. Nick Preston had the hat trick with singles coming from Jamie Jensen, Darrin Wilson and Matt Hamilton. Liam Reid got the win in goal, kicking out 35 of the 45 shots he faced. The Intermediates are on the road Sunday against New Westminster and again next Sunday, June 14 against Coquitlam to finish the season. Playoffs are expected to start the weekend of July 20-21. In the second game, it was the Jr. Shamrocks jumping out to a 9-2 first period lead and really never looking back as they romped to a 23-5 win over the visiting Port Coquitlam Saints. Scoring has not been a problem for the Shamrocks and obviously it wasn’t today either but the notable stat is allowing just 5 goals. Again it was Jesse King leading the way with 12 points on 4 goals and 8 assists. Chris Wardle added 3 goals and 2 helpers with 5 other players each chipping a pair and Devon Casey adding 6 assists to give him an 8-point night. Cody Hagedorn played 13:40 as the starter in goal before giving way to Charles Claxton. 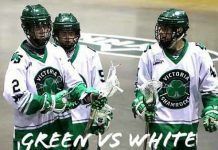 The Shamrocks face these same Saints in PoCo Sunday to finish their regular season. Playoffs for the Rocks will begin next weekend – tentatively Saturday, June 13. That game will take place at Panorama due to the unavailability of Bear Mountain and Juan de Fuca as Rock the Shores outdoor concert takes.